The Gallery’s collection of photographs spans the medium’s history, with exceptional holdings of work made in America during the 20th century. Of particular distinction in the collection are complete sets of master prints by Robert Adams, Donald Blumberg, and Lee Friedlander. The first significant group of photographs to enter the Gallery’s collection were two extraordinary sets of images by Man Ray. A group of fifteen “Rayographs” came to the Gallery in 1941 from Marcel Duchamp and Katherine S. Dreier as part of the Société Anonyme collection of modern art, followed in 1953 by an additional group of photographic prints and Rayographs in a bequest from Dreier’s estate. The Gallery began to actively collect photographs in 1971, with the acquisition of twenty-five prints by Walker Evans, who taught at the Yale School of Art from 1964 to 1974, and today the collection holds over 700 of Evans’s prints and Polaroids. The collection holds sets of master prints by Robert Adams, Donald Blumberg, and Lee Friedlander, along with significant holdings of work by Lucien Aigner and Inge Morath. 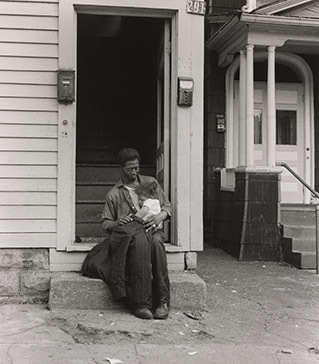 The collection also includes strong examples from the tradition of street photography, including works by Robert Frank, Lewis Hine, Helen Levitt, and Garry Winogrand, and notable images of war and social upheaval by Larry Burrows, Dorothea Lange, Charles Moore, and W. Eugene Smith. Committed to collecting the work of significant figures working today, the Gallery has acquired key works by Adam Broomberg and Oliver Chanarin, Zhang Huan, An-My Lê, Christian Marclay, Judith Joy Ross, Mark Ruwedel, James Welling, and others. The Gallery proudly features photographs by some of the medium’s most influential educators—including Richard Benson, Carl Chiarenza, Emmet Gowin, Nathan Lyons, and Tod Papageorge—as well as examples by prominent graduates from the Yale School of Art. The collection is available to students and scholars through exhibitions and by appointment. Please email yuag.photo@yale.edu at least two weeks in advance to view original photographs. All appointment requests must be made in writing. 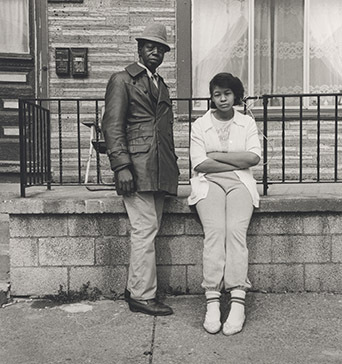 The Gallery recently received a gift of 64 prints by the 20th-century American photographer Milton Rogovin, including 39 works from his Lower West Side, Buffalo, New York series. 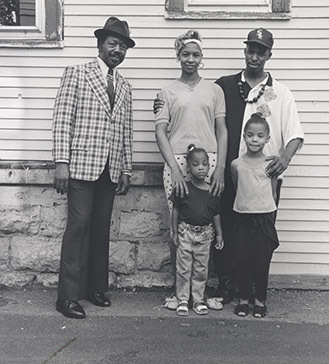 In 1972 Rogovin began a 30-year project photographing the residents of Buffalo’s Lower West Side, a historic neighborhood adjacent to his optometry practice. The series presents a dynamic image of the community, which has long been home to a mix of ethnic groups, immigrant families, and working-class people—subjects who traditionally have been underrepresented in American visual culture. His sensitive portraits convey the mutual trust and positive regard that he established with his collaborators. Upon completing his initial survey, Rogovin reengaged his subjects on two more occasions, first in the mid-1980s and again in the early 1990s. The resulting triptychs introduce a narrative element to the series, revealing how individuals grow and families change through the steady passage of time. Make an appointment to see this compelling series or other prints in our new photography space. Judy Ditner is the Richard Benson Associate Curator of Photography and Digital Media. Her research interests in photography span the history of the medium, with emphases on documentary and conceptual practices. Ditner has worked on exhibitions for the International Center of Photography and the New Museum in New York, the Gwangju Biennale in South Korea, and the Ryerson Image Center in Toronto. She holds a PH.D. in art history from Boston University with specializations in the history of photography and contemporary art, an M.A. in curatorial studies from Bard College, and a B.F.A. in photography from Ryerson University in Toronto. Adams, Robert. The Place We Live, A Retrospective Selection of Photographs, 1964–2009. 3 vols. With essays by Joshua Chuang, Tod Papageorge, Jock Reynolds, and John Szarkowski. New Haven: Yale University Art Gallery, 2011. Adams, Robert. denver: A Photographic Survey of the Metropolitan Area, 1970–1974, rev. ed. New Haven: Yale University Art Gallery, 2009. Adams, Robert. Sea Stories. New Haven: Yale University Art Gallery, 2011. Adams, Robert. This Day: Photographs from Twenty-Five Years, The Northwest Coast. New Haven: Yale University Art Gallery, 2011. Adams, Robert. Summer Nights, Walking. New Haven and New York: Yale University Art Gallery and Apreture, 2009. Adams, Robert. What Can We Believe Where? : Photographs of the American West. New Haven: Yale University Art Gallery, 2010. Adams, Robert. What We Bought: The New World—Scenes from the Denver Metropolitan Area, 1970–1974. New Haven: Yale University Art Gallery, 2009. Anderson, Ash, Paul Katz, and Richard Benson. From Any Angle: Photographs from the Collection of Doris Bry, exh. cat. New Haven: Yale University Art Gallery, 2008. Chuang, Joshua. First Doubt: Optical Confusion in Modern Photography, exh. cat. New Haven: Yale University Art Gallery, 2008. Chuang, Joshua, ed. Yale University Art Gallery Bulletin: Photography at Yale (2006). Cornell, Daniell. Alfred Stieglitz and the Equivalent: Reinventing the Nature of Photography, exh. cat. New Haven: Yale University Art Gallery, 1999. Friedlander, Lee. In the Picture: Self Portraits, 1958–2011. New Haven: Yale University Art Gallery, 2011. Friedlander, Lee. JFK: A Photographic Memoir. New Haven: Yale University Art Gallery, 2013. Friedlander, Lee. Playing for the Benefit of the Band: New Orleans Music Culture. New Haven: Yale University Art Gallery, 2013. Lyons, Nathan. After 9/11: Photographs, exh. cat. With a poem by Marvin Bell. New Haven: Yale University Art Gallery, 2003. Ranney, Edward. The Lines. New Haven: Yale University Art Gallery, 2014. Reynolds, Jock. Emmet Gowin: Changing the Earth, exh. cat. New Haven: Yale University Art Gallery, 2002. Ross, Judith Joy. Judith Joy Ross: Portraits of the Hazleton Public Schools, Hazleton, Pennsylvania: 1992–1994. With an essay by Jock Reynolds. New Haven: Yale University Art Gallery, 2006. Ruwedel, Mark. Westward the Course of Empire. With an essay by Jock Reynolds. New Haven: Yale University Art Gallery, 2008.